Jahani & Associates analyzed over 200 M&A transactions and equity investments in digital health from 2013 to 2016. We mapped a selection of these companies onto a 4-quadrant plane to understand their natural differentiators. We considered both the scope of care delivery (for example an urgent care company vs a software analytics company) and the size of the company’s financials and number of employees. These companies typically have a large customer base, but are relatively lean due the simplicity of their products. These are socially themed companies like Fitness Keeper and bWell. 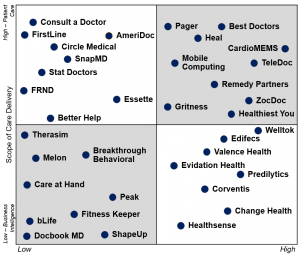 These are software dominated companies who built business by providing automation, simplicity, and streamlining the data rich and complex USA healthcare ecosystem. 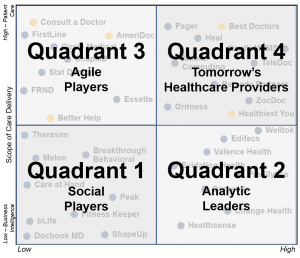 Our research indicates these companies are in the process of competing to transition to quadrant 4. They have strong customer relationships and are starting to scale. THPs are the dominant players of today and tomorrow. These are companies that proven a ability to scale, are generally profitable, and have strong brands. They are challenged to increase their competitive advantage by generating new innovative digital health products or by acquiring other innovative companies. Jahani & Associates works with digital health companies to identify, develop, and implement their competitive advantage empowered by intangible assets. Joshua is an energetic and passionate leader, technologist, and consultant with over 10 years of strategic planning, tactical centered implementation, and management consulting experience. 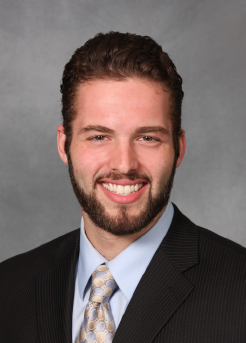 Joshua utilizes proven qualitative and analytical skills driven by business objectives and up to date technology. He has spearheaded the movement towards rapid evolution and sustainable growth using rigorous profitability, ROI, and TCO analysis for organizations of all sizes. Working with exciting start ups in digital advertising or large Fortune 500 companies keeps him traveling all over the world. He graduated from Cornell University. © 2019 Jahani & Associates LLC. All rights reserved.